Fancy having a trackpad or touchpad to replace the mouse, or fed up with notebook trackpad which does not support multi-touch? Now it’s possible to turn the iPhone or iPod touch as a wireless trackpad (which can be used as a mouse but with finger touch) and keyboard for a computer, thanks to Logitech Touch Mouse app and server. The Touch Mouse app for your iPhone or iPod touch. The Touch Mouse Server for your Mac or PC, which must be installed on any computers which user want to control with Touch Mouse. Logitech Touch Mouse works over Wi-Fi wireless connection to connect iPhone or iPod touch device with computer, effectively allowing user to control Mac or PC from anywhere within coverage range of the WiFi network. 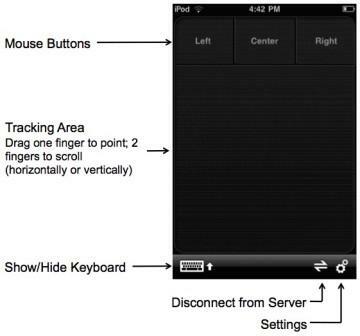 When typing with remote keyboard on Logitech Touch Mouse on iPhone or iPod touch, text is displayed on screen of mobile device too so that users can see what they’re typing. Navigate to www.logitech.com/touchmouse to download and install Touch Mouse Server software on Macintosh running Mac OS X 10.4 or above or PC running Windows XP or above. Mac – Find the file iTouch-Server.app and double-click it. The server icon will appear in the Menu Bar. PC – Go to the Windows Start Menu and select Logitech Touch Mouse Server. The server icon will appear in the system tray. Run the Touch Mouse app on iPhone or iPod touch. Select the computer that want to control from the list. The server icon will change to when the iPhone or iPod touch connects to the Touch Mouse Server. Once partnership is established, user can use the trackpad as mouse. Simply point by dragging one finger over the trackpad, scroll vertically or horizontally by dragging two fingers over the trackpad, or switch between portrait and landscape modes by rotating your iPhone or iPod touch.